Brackley Town boss Kevin Wilkin says third place is the target in his side’s bid for promotion. Saints are fifth in Vanarama National League North ahead of Saturday’s home game with Kidderminster Harriers. Saints will have to hit the ground running after having their last two games postponed, at Hereford in midweek and Altrincham last Saturday. So Saints will have to be ready to take on a Harriers side which could close the gap on them. It also means two more midweek away trips to fit in. On the plus side, Saints have only slipped one place, three points behind Spennymoor Town, despite their inactivity while Jimmy Armson and Daniel Nti would have both missed the trip to Altrincham. But Saints will be without Mansfield Town loanee Sterling-James on Saturday as he is on international duty with Saint Kitts & Nevis for their match against Suriname. 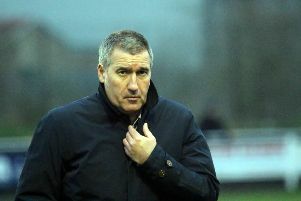 Wilkin said: “Third place is realistically our aim, to miss the first round of the play-offs would be great and then we would be at home in the semi-final. “Second spot would be a bonus but third is what we’re after and as much as we can hope for at the moment. “The teams around us haven’t been able to take advantage of us not playing and we’ve been able to hold out position. Hopefully we can stay there after the weekend. “It worked out okay for us with Jimmy [Armson] and Daniel [Nti] not being available but we’re missing Omari [Sterling-James] this weekend on international duty. New arrival Alex Prosser, who has been a regular in Aston Villa’s under-23 side this season, has joined the club on-loan and will be in the squad for Saturday’s game.